We’d love your help. 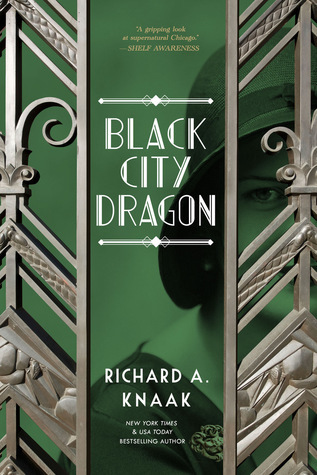 Let us know what’s wrong with this preview of Black City Dragon by Richard A. Knaak. For sixteen hundred years, Nick Medea has guarded the gate between our world and Feirie, preventing the Wyld--the darkest Feirie of all--from coming into Chicago to find human prey. But since he def A historical urban fantasy set in Prohibition-era Chicago, which combines action, mystery, and romance against a backdrop of gangland wars and the threat of supernatural horror. To ask other readers questions about Black City Dragon, please sign up. Richard Knaak It's the third in the Black City Saint series. While each novel has a separate story, they do build on one another. Enter the giveaway (ends 4/4/19) and check out my interview with Richard A. Knaak about the Black City Saint series @ Metaphors and Moonlight! Every time I read a book in this series, I feel the need to bring up how much I absolutely love what a unique combination of elements it has. Fae, Catholic saints, the Prohibition Era, reincarnation---it even has a dragon! It's such a Enter the giveaway (ends 4/4/19) and check out my interview with Richard A. Knaak about the Black City Saint series @ Metaphors and Moonlight! Every time I read a book in this series, I feel the need to bring up how much I absolutely love what a unique combination of elements it has. Fae, Catholic saints, the Prohibition Era, reincarnation---it even has a dragon! It's such a strange and unexpected combination, but one that the author really makes work. Plus there was another interesting mystery to solve, another nefarious villain to beat, and the same group of characters I've come to really root for. Nick was his usual hard-boiled self, Claryce was her usual feisty self, and both were stubborn as mules. Almost every dangerous situation they went into, Nick would tell her to stay put outside or attempt to keep her away, and then she'd show up anyway, just in time to save him. But they both have a lot of strength and don't back down from things, so they make a good pair. And Nick seemed a little less hard-boiled and disenchanted this time. I think having Claryce around has been good for him. He seems like he might be subtly changing over the course of the series, but he still has the occasional quip of dry humor born of exasperation/resignation. Of course there was Fetch too, who was sometimes more dog than... whatever he is. He's frustrated me at times in the past, but he's grown on me. You gotta love him, despite his constant use of slang and his attempts to eat everything in the Kelvinator. Even Diocles and Kravayik got in on the action a bit more this time. And there was more dragon in this one! Not just his snide remarks, though I do love those (as evidenced by the status update below that I made while reading), but also Nick actually letting him out, using his powers, letting his body transform. And, I mean, who doesn't like reading about dragons? I always like it a little too much when Nick and the dragon work together because I'm like, "Awww, they're buddies!" but then the dragon goes and says something terrible or tries to take over, and I'm like, "Oh yeah, that's why they're not buddies." But really, the dragon is so interesting to me. Also I think he's starting to rub off on me because there was one point during the story when Nick was trying to figure out a solution for something, and my immediate idea was to burn. Turns out that was actually not the right solution. I guess that's why Nick is the saint and the guardian of the gate to Feirie and not me. This book also had some twists that I really did not see coming. I wonder now if there were hints of one of them before and I just hadn't realized. I'll admit that the details while Nick is trying to piece everything together and figure out what's going on sometimes elude me, but that never makes me enjoy the books any less. I trust that I'll understand the important parts and the actual stuff that happens, and I always do. I can appreciate how complex the plots of these books are and how, despite having separate plots for each book, there are still bits and pieces that connect. It makes me wonder where the series is headed. Overall, this was another highly enjoyable, complexly plotted book in a great 1920s urban fantasy series! Fans of Books 1 and 2 in Richard A. Knaak's Black City Saint series. Anyone who likes urban fantasy, fae, dragons, Catholicism, the Prohibition Era, and complex relationships. This review has been hidden because it contains spoilers. To view it, click here. In the third appearance of Nick Medea, in the Black City Series, Nick not only takes on the Dragon he killed in his incarnation as Saint George. He also takes on the emperor Galerius who was instrumental and responsible for his death two-hundred years ago. Nick enlists the beloved cast of helpful compatriots Fetch, Claryce, and the recovering Kravayik to assist him in his quest to keep Chicago and Its environs safe from the fae escaping through the gaps in the gates between the land of Faery and In the third appearance of Nick Medea, in the Black City Series, Nick not only takes on the Dragon he killed in his incarnation as Saint George. He also takes on the emperor Galerius who was instrumental and responsible for his death two-hundred years ago. Nick enlists the beloved cast of helpful compatriots Fetch, Claryce, and the recovering Kravayik to assist him in his quest to keep Chicago and Its environs safe from the fae escaping through the gaps in the gates between the land of Faery and the Humans. I love these books. Adventure, fantasy, a love story, all with funny characters and interesting villains. I can't wait to see what happens to Nick Medea next! Richard Knaak is back and at the top of his game again with the urban fantasy Black City series. Nick Medea returns as a combination of Phillip Marlow and Harry Dresden, a “ghostbuster “ in an alternate Prohibition Era Chicago where the Fae mingle with the mob. Quick moving and with a great feel for the era it represents, it’s a joy to see another book in this series. Recommended! There are distinct disadvantages to being late to the party in terms of reading a series, and with this series in particular, I found myself flailing around trying to deal with the author's frequent references to events of previous books, people who never appear in this volume but who apparently play huge parts in the first two, and so on. Yes, you can read this and get the story straight, but it does take some extra effort to grasp the deeper implications of the events here. That's fine, the onl There are distinct disadvantages to being late to the party in terms of reading a series, and with this series in particular, I found myself flailing around trying to deal with the author's frequent references to events of previous books, people who never appear in this volume but who apparently play huge parts in the first two, and so on. Yes, you can read this and get the story straight, but it does take some extra effort to grasp the deeper implications of the events here. That's fine, the only thing Knaak is responsible for is writing a book that can be read on its own. Whether it can be truly enjoyed and appreciated as a stand-alone is another thing entirely. We are introduced to Nick Medea who, we are told, is St. George of St. George and the dragon fame. But instead of simply killing the dragon and becoming a saint, Nick and the dragon merged, and for 1600 years, they've battled for control. We meet Claryce, a woman who has shared dozens, perhaps hundreds of her incarnations with Nick. And there's where the confusion began for me because her previous incarnations are often referenced by name: Cleolinda, Clarissa, Claudette, and more, turning one person into an entire cast of characters. There's Fetch, who appears to be a large dog, but who can talk, but only in Nick's presence, there's Diocles, a ghost who haunts Nick because in his life he killed him, and now can't rest until Nick forgives him, which he won't do, and yet he hates having Diocles around. Diocles can only materialize on holy ground, so I'm not entirely certain why Nick doesn't just avoid places like that as much as possible, or just forgive and say "Get out of my face!" It's been 1600 years after all. Nick knows how to hold a grudge. They're trying to stop an old enemy of them all from... well I'm not entirely sure what his endgame is except to change reality. He does manage to do some of that with the help of a magical deck of cards, but the result is that the anchors to this universe become confusing when Galerius changes parts of their reality into our own. And for me the word that best describes this book really is "confusing." I spent a lot of time muttering "What?" or "Wait who is that?" or "When did that happen?" I figured it'd all come together eventually, and to be fair, much of it did, but not enough to satisfy me. But there are so many characters with so many stories which are supposed to be important that the overall effect is to muddle what should have been a more straightforward fantasy/thriller. So, will I read the first two? The first one? I'm not sure. I got enough out of this one to finish reading, which is something, and I rather liked the universe even if I found Nick to be surprisingly bland. Possibly I'll read the first and everything will fall into place, and convert me to a rabid fan of the series. Black City Dragon is the third installment in the series, one I have been waiting for since I first came across it. Nor was I disappointed. This novel deal a lot with the protagonist's past (Nick Medea, aka St George). As such it is imperative to read the first two volumes first - just so you'd get that the build-up of excitement to the backstory dealt with in this volume. Here we learn more about Nick's past, with his relationship of the dragon and Cleolinda as well as more about t Black City Dragon is the third installment in the series, one I have been waiting for since I first came across it. Nor was I disappointed. This novel deal a lot with the protagonist's past (Nick Medea, aka St George). As such it is imperative to read the first two volumes first - just so you'd get that the build-up of excitement to the backstory dealt with in this volume. Here we learn more about Nick's past, with his relationship of the dragon and Cleolinda as well as more about the complex world he lives in. As more is revealed about the world, about Feirie and other powers, it also raises new questions - a perfect setup for the next book in the series. There is also an extra short story at the end, Black City Shadows, which was originally published in Grimdark Magazine. Who doesn't love great bonus material? I absolutely love the hardboiled detective style first-person narration mixed in with high and mighty fantasy elements. The fact that it is on the background of an exciting historical period is just the cherry on top. Speaking of which, Knaak certainly brings Chicago of the 1920's to life with amazing research and trivia (from slang, to gangs, to architecture). This all gels together for a rich and immersive world in which his wonderful and unique characters thrive. There are definite elements of alternate history (besides the obvious inclusion of magic), so bear with the author. However, the period is depicted extremely well which includes the attitudes of the protagonist towards women. Don't mistake them for the attitudes of the author - all his characters are strong and capable - but some might find issues with it. As this is book three and references previous events, I would strongly recommend you read them in order. If the idea of a noir-historical-fantasy-detective blend appeals to you, this is definitely a good read. It does a great job of bringing together elements of urban fantasy into the historically-accurate 1920's Chicago setting. An excellent novel - which you would know if you read the first two (and you should read in order). Centuries have gone by and you would think that things would be getting easier for Nick Medea. Protector of the Gate to Faerie...hunter of the Wyld...conqueror of the Dragon, that SHOULD bring with it some form of respect. But...recently... he has battled, and defeated, Oberon, the King of the Faerie and then confronted H.H. Holmes, the Beast of Chicago, stopping his apocalyptic plans. Now, perhaps the most evil and dangerous enemy from his past has returned...the one who was ultimately responsib Centuries have gone by and you would think that things would be getting easier for Nick Medea. Protector of the Gate to Faerie...hunter of the Wyld...conqueror of the Dragon, that SHOULD bring with it some form of respect. But...recently... he has battled, and defeated, Oberon, the King of the Faerie and then confronted H.H. Holmes, the Beast of Chicago, stopping his apocalyptic plans. Now, perhaps the most evil and dangerous enemy from his past has returned...the one who was ultimately responsible for what Nick is today...and he's not sure if he can stop that evil from changing the human world and destroying the land of Faerie forever. To make matters worse, everything that Nick believed about his life may have all been a lie. The answer to it all may come down to the turn of a card. Richard Knaak returns once more to the terrifying world of the BLACK CITY - Chicago of the 1920s and gives us the third story in the history of NICK MEDEA. Knaak combines myth and legend in an alternate world where Saints walk the earth, creatures of faerie stalk humanity to eat, love survives death, and hate not only never dies but only grows stronger. Richard Knaak is the best selling author of such iconic stories as the Legend of Huma and Kaz the Minotaur in the DRAGONLANCE world; creator of the long running and amazing DRAGONREALM; the new universe of REX DRACONIS; and now the world of the Black City Saint - NICK MEDEA. Richard's abilities as a story teller and world builder are showcased in these books and will entertain and capture your imagination. My Review: This series has been one of my favs since I picked up the first book a while ago. I and die hard in love with the uniqueness that this series gives us readers and I just could not put it down. This one has to be the best yet I mean it has more DRAGON!! And who could say no to that one? The story was so good it had some great twists and turns that I didn't see coming and I thought that the pacing was really good. The only thing that bothered me in this one was that some of the plot poi My Review: This series has been one of my favs since I picked up the first book a while ago. I and die hard in love with the uniqueness that this series gives us readers and I just could not put it down. This one has to be the best yet I mean it has more DRAGON!! And who could say no to that one? The story was so good it had some great twists and turns that I didn't see coming and I thought that the pacing was really good. The only thing that bothered me in this one was that some of the plot points of the mystery aspect of this story were kind of off. I was very confused by the end and can't wait for another one to tie it all together. i haven't read the other books in this series, but I very much enjoyed this story and will - for sure - go back and read the 2 previous ones now. Adventure and fantasy await you! I won this book in a goodreads giveaway! I'm really excited to start this book soon.